We're regularly asked what makes our raw honey exceptional. And although there are many different answers, the short difference is simple; it’s 100% Pure, Raw, Undiluted or Blended, never Micro Filtered and never Pasteurized. We also realize that the best honey comes from strong productive healthy hives and is why we spend countless hours “keeping the bees” making sure they have good nectar, pollen and water sources which are crucial to honey bee colony health. We are blessed to be able see the handy work of a creator who gave mankind such sustainable resources that the honey bee provides, and it’s an honor to share the fruit of ours… and the bees labor! 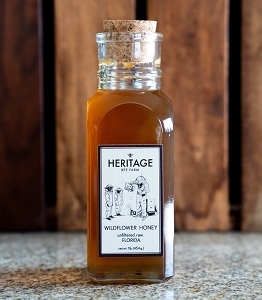 100% Raw Florida Honey Bears 2 oz (Quantity of 25) - Really Cute Wedding Favors! Custom Label for your Special Event! All Natural Bee Pollen 10oz. Cute Honey and Hive Gift Basket - Raw Honey, Beeswax Candle and Handmade soap. We realize that well cared for honey bees produce more honey, and we also know that they produce the best tasting honey! We look after our own honey bees, it’s a family endeavor and even today we still fill each bottle of honey ourselves, and we do this so that we know that it’s the best it can be… we can't envision doing things any other way. Try our large selection of 100% Pure Raw Honey Today! Sell our Honey and Hive Products! Copyright Heritage Bees. All Rights Reserved.